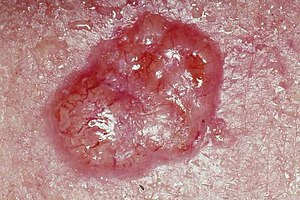 A basal-cell skin cancer. Note the pearly appearance and telangiectasia. အရေပြားကင်ဆာသည် အရေပြားမှ ဖြစ်ပေါ်လာသည့် ကင်ဆာဖြစ်သည်။ ပုံစံမမှန်သည့် ဆဲလ်များပြန့်ပွားလာပြီး ယင်းဆဲလ်များသည် ခန္ဓာကိုယ်၏အခြားနေရာများသို့ ကျူးကျော်ဝင်ရောက်လာခြင်းကြောင့်ဖြစ်သည်။. အဓိကအားဖြင့် အရေပြားကင်ဆာ ၃ မျိုးရှိပါသည်။basal-cell skin cancer (basal-cell carcinoma) (BCC), squamous-cell skin cancer (squamous-cell carcinoma) (SCC) and malignant melanoma. Basal-cell carcinoma Note the pearly translucency to fleshy color, tiny blood vessels on the surface, and sometime ulceration which can be characteristics. The key term is translucency. Squamous-cell skin carcinoma Commonly presents as a red, crusted, or scaly patch or bump. Often a very rapid growing tumor. 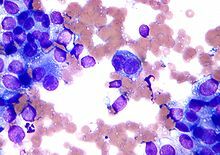 Malignant melanoma The common appearance is an asymmetrical area, with an irregular border, color variation, and often greater than 6 mm diameter. ↑ "Global, regional, and national incidence, prevalence, and years lived with disability for 310 diseases and injuries, 1990–2015: a systematic analysis for the Global Burden of Disease Study 2015." (8 October 2016). Lancet 388 (10053): 1545–1602. doi:10.1016/S0140-6736(16)31678-6. PMID 27733282. ↑ "Global, regional, and national life expectancy, all-cause mortality, and cause-specific mortality for 249 causes of death, 1980–2015: a systematic analysis for the Global Burden of Disease Study 2015." (8 October 2016). Lancet 388 (10053): 1459–1544. doi:10.1016/s0140-6736(16)31012-1. PMID 27733281.